Are you trying to hire rockstar PTs in a competitive area? Want to see an inexpensive trick no one else is using to find the exact kind of PT you want? Before we get to the trick, let me start out with a little story. This idea comes from myself, hiring developers in the San Francisco area where it’s super competitive because you’re competing with, big Tech Companies, lots of tech companies all over the place trying to get the best talent and we needed something to try to capture people, when we don’t have as big of a budget as they do. We tried this technique out and it worked like a charm. It’s great because it is cheap (under $5 per application), its targeted to attract the exact type of person you want, and no one else is doing it. 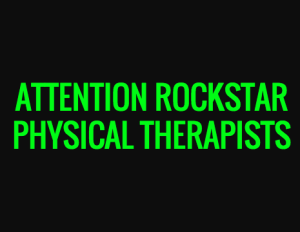 When I heard some practice owners were having the same challenge in hiring great physical therapists in areas where it was competitive to get them, I decided to test it out to see if it could help. Good news. It works as well or better. You can use facebook ads to drive the exact kind of therapists you are looking to hire directly to your job application and in this article I’m going to show you exactly how to do it. 4) Job Post Link – Enter the link where your job post is. This could be on your website or on craigslist. It does not matter. What does matter is the words you put on that page. They must be compelling to attract the kind of person you are trying to hire. We can do another post on this if people request it. 5) Create an image for your ad. The best thing to do here is just open up microsoft paint or powerpoint. Or Keynote if you use a mac like me and create an image. Words in a block usually work well. Use words that you think will resonate with the people you want to click. Next write a compelling headline and copy for your ad. Again, always try to think like the person you are trying to attract. 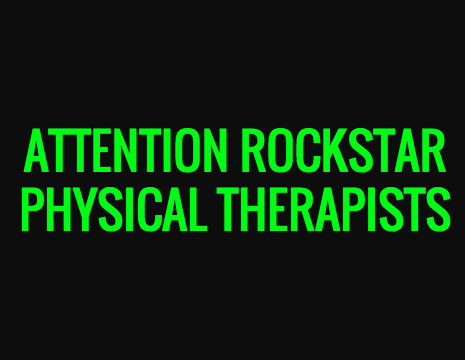 Even better, go ask your best PT what they love the most about working with you vs. other places for hints. Use their language. This way you get the exact people you want clicking on your ad. You definitely want to have one of these and the one that I’d recommend you choose is the, learn more one and what this does is just throws a button there that somebody can click which will send them to your job post. This is the most exciting and coolest part of the process which is where you can actually target the audience that you want in order to see this ad. It’s what makes facebook ads awesome. Location – Choose the location where you want this ad to show up. You can choose multiple cities if you want. As you choose notice on the right you will see your potential reach start to show up. This number will change as you choose different options. Age Range – Choose the age range of the person you’d like to hire. Definitely eliminate the people that are too young so you are not pushing this ad to kids which could end up clicking and costing you when they are not qualified for the job. Choose the language – Always add english but if another language is required you could add this too. Interests – Setting interests is really the most important part here. What this means is, in Facebook if somebody says they are interested in a subject, Facebook keeps track of that and when you choose what type of interest here in this ad that’s the only people that this ad is going to show up for, so in this case you want people who are interested in physical therapy. 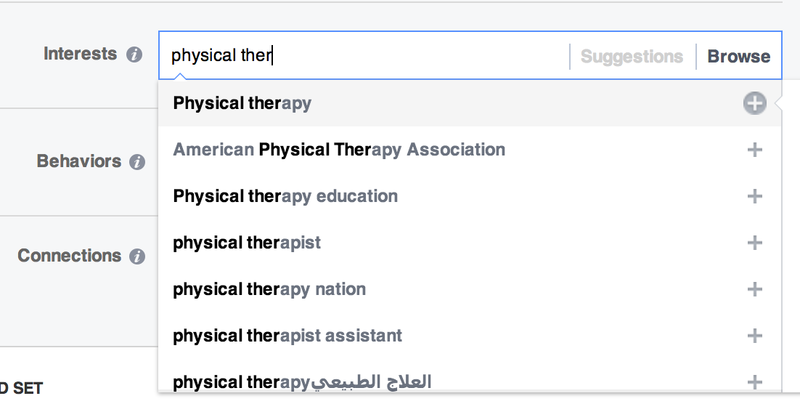 If you type “Physical Ther…” into the interest box, you will see several relevant options there. So if you’re hiring a PTA search for that and add it. If you’re hiring an OT, search for terms like that. Get the idea? Great. Name the ad set – this is for you and does not matter. It’s what shows up in facebook for you to manage the ad. Budget – You can set what you are comfortable with here. I’d choose $10.00 per day to start or so. You can go lower, if you want and adjust as necessary later. You will likely be paying between $0.30 and $1.00 per click. Of those clicks you will get a certain number of people that apply. A good conversion rate is 20-30% here. So for every 10 clicks you get 2-3 applications. Schedule – You can also schedule this to run now or in the future. I like to set an end date so I don’t forget about it. Give yourself a week to test and see how it does. Always set the bidding to “Bid for Clicks”. This means you are paying every time a user clicks. If you’d like, you can manually set a maximum you’d like to bid for each click you get. Facebook will make a suggestion to you and you can choose from there. Once you’ve done this you can run your ad and watch how it performs over time. If it’s working well you can sit back and watch the applications come in. Now you might be thinking “Could I do this to get more new patients from the public too?”. The answer is YES you can. Its a bit more complicated to target and we can cover that another time. If you are interested in that email me at carl@clinicmetrics.com. Once I get a few emails I’ll put a video together on that. And if you are interested in learning more cool tricks like this, signup for our mailing list by entering your email below.